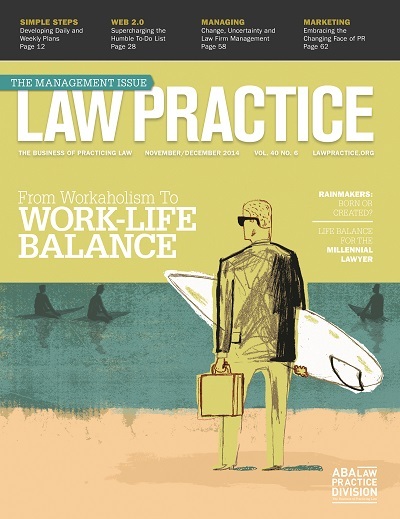 In the November/December 2014 issue of the ABA’s Law Practice magazine, I write about Embracing the Changing Face of PR. In the column, I write about how much the concept of PR has changed with time and technology. While I still believe that PR is a significant part of business development, the way you utilize it and how it works has little resemblance to the way that it functioned a decade or two ago. With print deadlines for Law Practice coming about four months prior to publication, it was summertime when I sat down to write this piece. What the column does not tell you is why I chose this particular issue to address PR. At that time, my first boss, Lou Corletto, had just passed away. I started my professional career as a PR professional, before law school, before a lot of things. In high school and undergrad, I had PR internships with the Baltimore Blast and Philadelphia Fever of the Major Indoor Soccer League (and at the league office). But my first formal PR training came via an internship with the Philadelphia Flyers. I learned a lot from the PR triumvirate of Rodger Gottlieb, Mark Piazza and Joe Kadlec. To this day, Mark and Joe are among my dearest personal friends. I “see” Rodger on LinkedIn from time to time, and while not in touch, have always appreciated what he did for me. They played a role in suggesting to the Washington Capitals that they hire me the following year. The Caps PR director was a long-time, old school, gentleman named Louis Corletto. For his memorial service, I sent along my thoughts and remembrances (ironically, an ABA meeting prevented me from attending in person). The memorial took place in Richmond, Virginia in August. I thought this would be an appropriate forum for sharing those words. Thanks Lou. I’m sorry that I could not be in Virginia today to say a proper goodbye to my dear friend Lou. He hired me as his public relations assistant for the Washington Capitals nearly 3 decades ago in 1985. I was a fresh out of college, 22 year old know it all that came to him via Temple University and a PR internship with the Philadelphia Flyers. No matter how condescending or insubordinate I was, Lou never raised his voice, never disciplined me, never did anything but show patience and try to teach me the way that maybe I should behave. He was a tremendous mentor who knew how to treat people–regardless of rank or stature. I was especially appreciative of the way he would treat my parents as they entered the Capital Centre–like they were the Mom and Dad of someone quite important. One particular anecdote in 1986 has always stuck with me. Lou asked me to include in the media notes a welcome to corporate sponsor Ace Hardware. He was under some fire by the Caps marketing guy. I said that the media notes were for the media, not to welcome sponsors. Lou asked if I could please do it. I responded that I did not want to, but would if he ORDERED me to do it as my boss. He said that he would not order me to do it, but hoped I would. I did not. Later that night, he came up to me and said “you couldn’t have done that for me?” I said “I told you if you wanted them in, you needed to insist upon it.” He never brought it up again. He would not punish me and rarely said no to a request from me. The sheer disappointment in his face that night was enough to make sure I never did something like that again. He did not order, instruct, yell or curse–Lou Corletto got things done with kindness, respect and a hearty laugh. As a young man, I’d complain that all he did was play golf at Congressional or have lunch with Larry King at Duke Ziebert’s. All this while I slaved away at the typewriter doing the real PR work. As I matured, I learned that any punk can write game notes, but not everybody can pick up the phone and ask George Michael at NBC or George Solomon at the Washington Post for a favor. As the years went on, knowing that he enjoyed so many moments like those only lightened my heart. Fast forward to the late 90s. I had gone to law school and was living outside of Philly in Voorhees, New Jersey. Lou showed up unannounced. He was at the train station and needed a place to stay. I had a little one bedroom apartment. Lou stayed with me, sleeping on the futon in the living room and making phone calls–looking to get back on his feet. I listened as he called some of the great people in the NHL–David Poile, Bill Torrey, Larry Pleau, John Halligan, his dear friend Nate Greenberg and others–looking for help in getting another opportunity to do what he did best. It was impressive that he made the calls and that everyone would take the calls as well. As we spent time together, I told him this was my penitence, the payback for the Ace Hardware omission. This was my chance to give back to someone who deserved it. He just laughed and said that he loved me. Lou could only remember the half full part of dealing with me. That is how he lived his life. Eventually, with the help of our mutual friend George Starr, we saw Lou on to his next stop in Raleigh, North Carolina. I told him my young girlfriend did not understand what this guy was doing at my apartment. Lou understood. Today that girlfriend is my wife of 14 years. Lou loved hearing about my six year old son and 10 year old daughter as they’ve grown up. In our conversations, he always told me how much he appreciated me. He never let the rocky times keep him down. Lou was ever the optimist. I enjoyed sitting with Commissioner Lou at a Southern Hockey League game and PR director Lou at a Major Indoor Soccer League game. But it was his love of the Caps and the NHL that brought the widest smile to his face. He truly appreciated everything and everybody. I learned a lot from the man. There are times where I could stand to learn a little more. I’ll always cherish his friendship and miss him. As NHL photographer Bruce Bennett said upon hearing of his passing, he is up there in that great press room in the sky smiling and laughing and taking care of people. That is what he did. Rest in peace, Lou. I’ll always appreciate the times we had together–good and bad–but especially appreciate that you only saw the good in people. Tagged: "ABA Law Practice Magazine", "Lou Corletto", "philadelphia flyers", "Public Relations" and "Washington Capitals"